seeing where a local resident lives. Lows: No lows that I can think of. 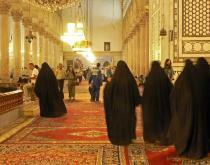 Best Moment: Watching the rituals at the Umayyad Mosque. Syrian man's apartment so that he could show me his home (much more innocent than it sounds). Smells: No prominent smells (cigarette smoke just goes without saying in the Middle East). the souk and leading up to the mosque. 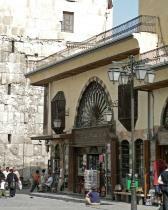 arm-in-arm and hand-in-hand with other men; cobblestoned streets of old Damascus. Street Food: Great juices; breads with different fillings; gummy candies. Fun Food Finds: Didn't really see any. Donuts right before we showed our passports at the Syrian border). Washington, D.C. It was $100 and took one week to get back. Type of currency? Syrian Pound. One U.S. Dollar equals approximately 50 Syrian Pounds. Bosra and Crac des Chevaliers). Outside of the Umayyad Mosque. 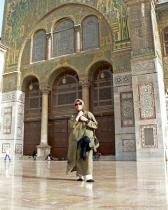 The Umayyad Mosque front facade.